Abraham Lincoln often gets credited for saying "Give me six hours to chop down a tree and I will spend the first four sharpening the axe." I'm not sure if it's him. But it sounds like it could be him — especially since it seems like he'd have things to say about axes. I'm working on a video for a client. We're still at a storyboard stage. We had three or four rounds of handwritten notes and sketches even before we got to anything digital. 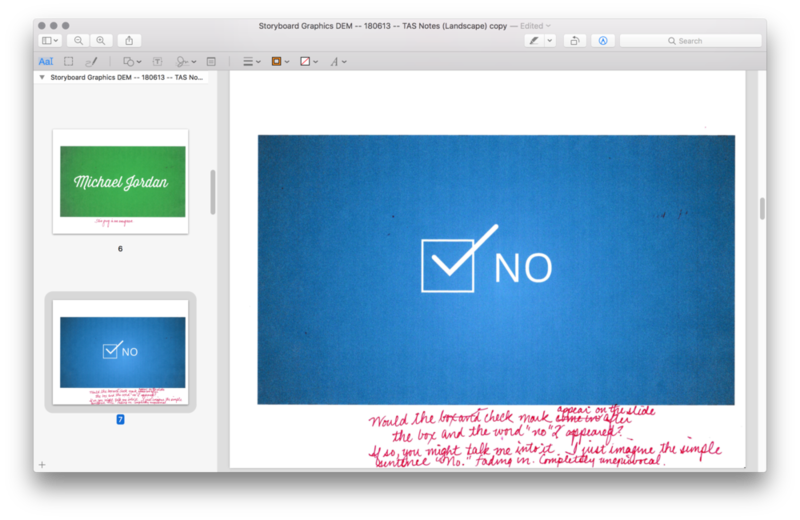 I like Keynote because I can do concepts and final work within the same software. Keynote's got cinema-quality effects and world-class tools for the kind of video this one will be. (I didn't start out with wanting to develop it in Keynote. That only came up after the initial talks with the client. It doesn't matter to the client what software I use. They simply want their video to communicate what it is they want it to say. I started in Keynote, shared a PDF with the client, the client printed the PDF, made notes, scanned the pages, and sent me a PDF of his notes. We'll have at least one more round of these types of edits before we start animating the cells. Not every video needs to be created this way. But you can tell which ones are. I'll update you on the process soon.